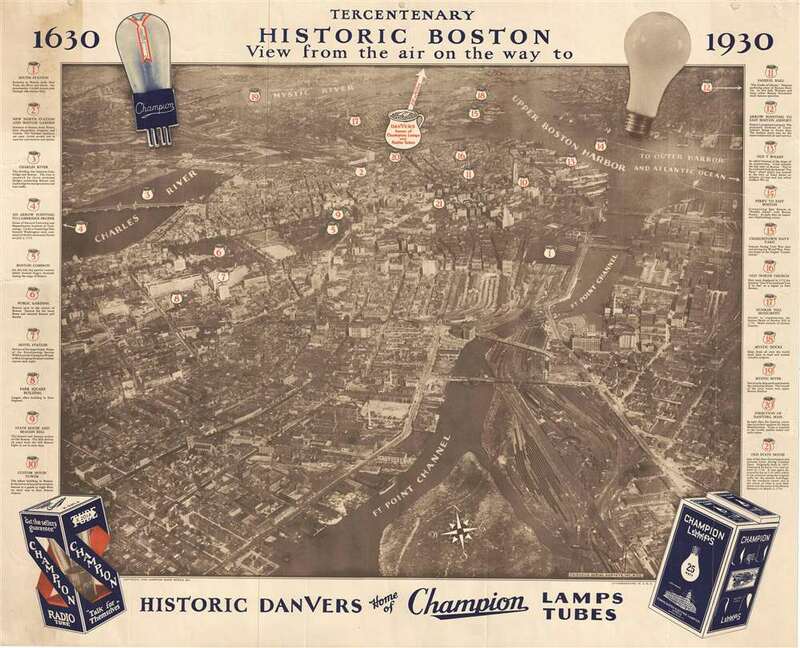 Remarkable aerial photograph of Boston advertising lightbulbs! Tercentenary Historic Boston View from the Air on the Way to Historic Danvers Home of Champion Lamps Tubes. This is a 1930 Fairchild Aerial Surveys and Champion Radio Works map or view of Boston, Massachusetts. The map depicts Boston from the Charles River to Boston Harbor and the Fort Point Channel and from the Mystic River and Upper Boston Harbor to the Fort Point Channel. Twenty-one different locations in and around Boston are numerically labeled using what appear to be small pots, such as the south and north train stations, Boston Common, the Hotel Statler, then the newest of the 'large hotels', and the Old North Church. Explanations for these locations are situated along both the left and right margins. By using an aerial photograph, this Champion Radio Works promo allows for a much more realistic view of Boston. Individual buildings are distinguishable, including Boston Garden, which was opened only two years before this photo was taken. The photograph is framed by an advertisement for Champion Lamps and Tubes. A Champion bulb is depicted in the upper left corner, along with a packaged radio tube on the lower left and a packaged lamp bulb on the lower right. This aerial photograph was taken by Fairchild Aerial Surveys, Inc. of New York City and the advertisement was copyrighted by Champion Radio Works Inc. in 1930. This is a lithograph. Sherman Mills Fairchild (April 7, 1896 – March 28, 1971) was an American inventor, entrepreneur, pilot, and photographer active in New York in the first half of the 20th century. He was the son of George Winthrop Fairchild, a Republican Congressman and Co-Founder of IBM. He inherited his father's vast estate in 1924, becoming IBM's largest shareholder. After studying at Harvard, the University of Arizona, and Columbia University, Fairchild invented the synchronized camera shutter and flash – a significant advancement in photography. Sherman was chronically in poor health, nonetheless, when World War I broke out he volunteered for the military. Due to his health, he was rejected by the military and so decided to contribute to the war effort in another way. He took a contract with the U.S. Government to develop a new kind of aerial camera capable of taking sequentially timed photographs for advanced aerial terrain mapping. This invention led to the founding of the Fairchild Aerial Camera Corporation (later the Fairchild Camera and Instrument Company) in 1920. In 1921, he purchased a surplus World War I Fokker D. VII biplane and expanded with his own aerial survey company, Fairchild Aerial Surveys. His first map, also the first aerial photo-survey of a major city was of Newark, New Jersey. This was quickly followed by a large aerial survey of Manhattan, also completed in 1921. Other cities followed. Later the Fairchild Corporation developed even more advanced cameras, including the Fairchild Lunar Mapping Camera, used by NASA to take photos of the Moon from orbit. He also founded Fairchild Aviation Corporation, which built the FC-1 and FC-2 Aircraft. The firm went on to become one of the largest military and defense contractors in the world. Fairchild died in 1971, leaving behind an $200+ million dollar estate to varies charities and foundations. Good. Backed on archival tissue for stability. Closed and repaired tear extending eight inches into printed area from right margin.